At a time of sorrow, an exquisitely colorful bouquet stands as a symbol of hope and a reminder of the beauty of life. This brilliant arrangement of red roses, pink lilies, yellow lilies and other cherished flowers will be deeply appreciated. * I was very happy with the web site. Very clear product information. 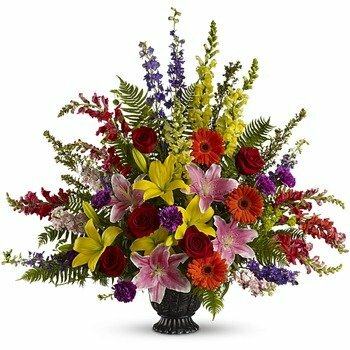 * I have used 1st in Flowers before and they reached my expectations for good service.